Expert panorama with DSLR and iPhone. 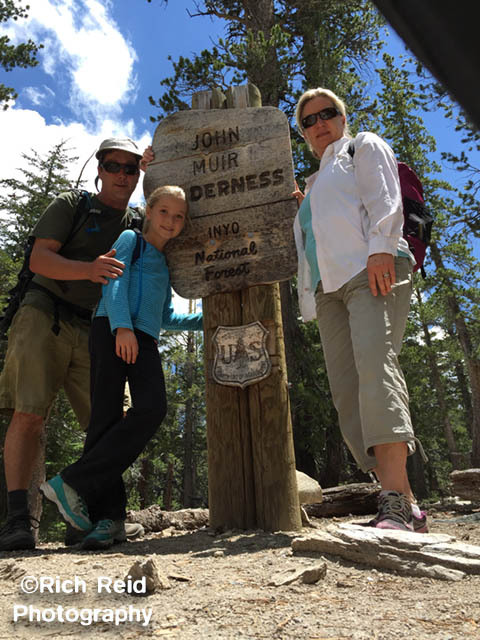 My family likes trees and recently we explored the twisted ancient pine forests in California’s Eastern Sierra Mountains. 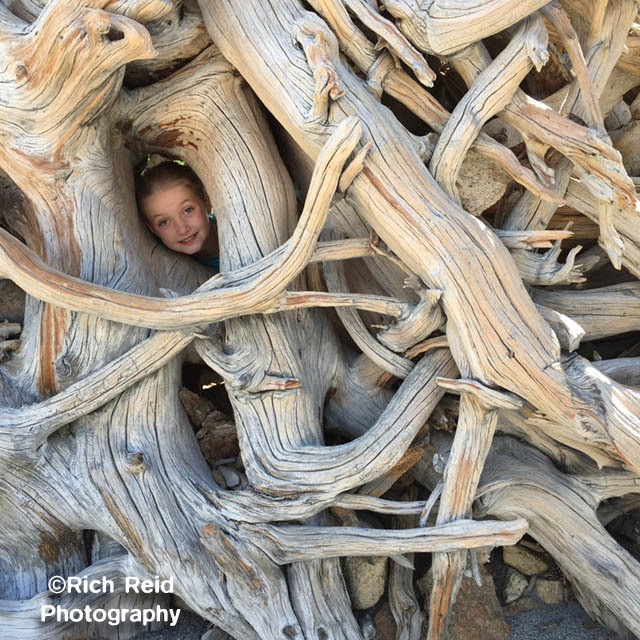 During our day-hikes to some of the Mammoth Lakes and then camping in the steep canyons of Whitney Portal, we found some magnificent trees that are worthy of sharing. 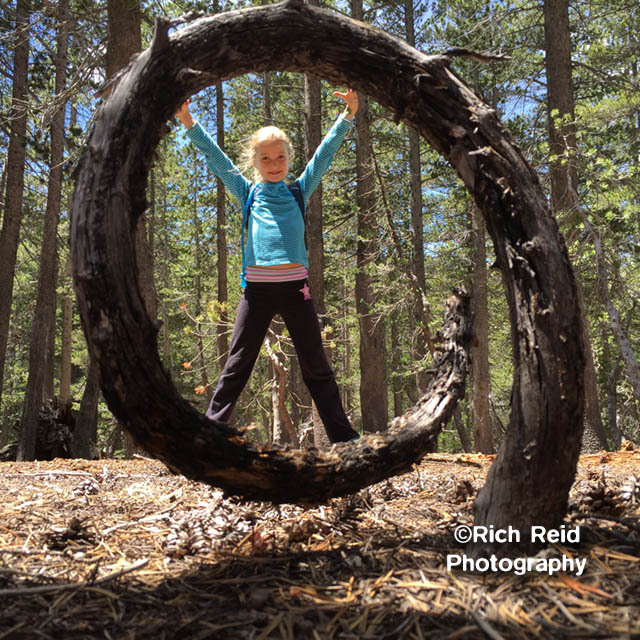 What made our adventurous hikes entertaining was the discovery theme of “knot what you think.” In photographic terms; juxtaposition perception having fun with our iPhone cameras with the craziest trees we could find. Knot What You Think…ode to trees. The Reid Family. KNOT WHAT YOU THINK. 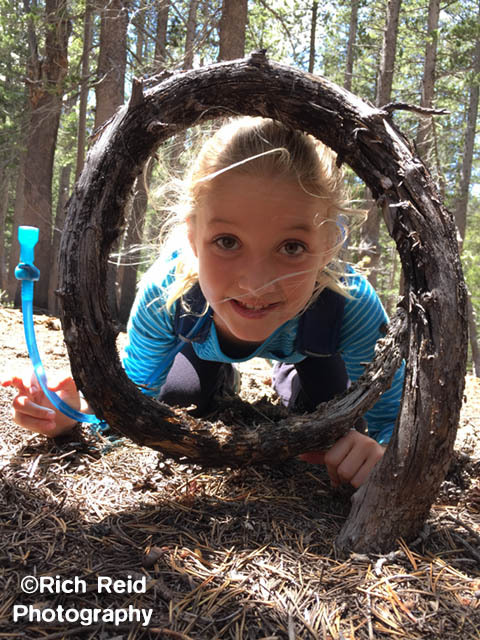 Juxtaposition in a tree circle at Mammoth Lakes. KNOT REAL. Juxtaposition in a tree circle at Mammoth Lakes. KNOT RIGHT. 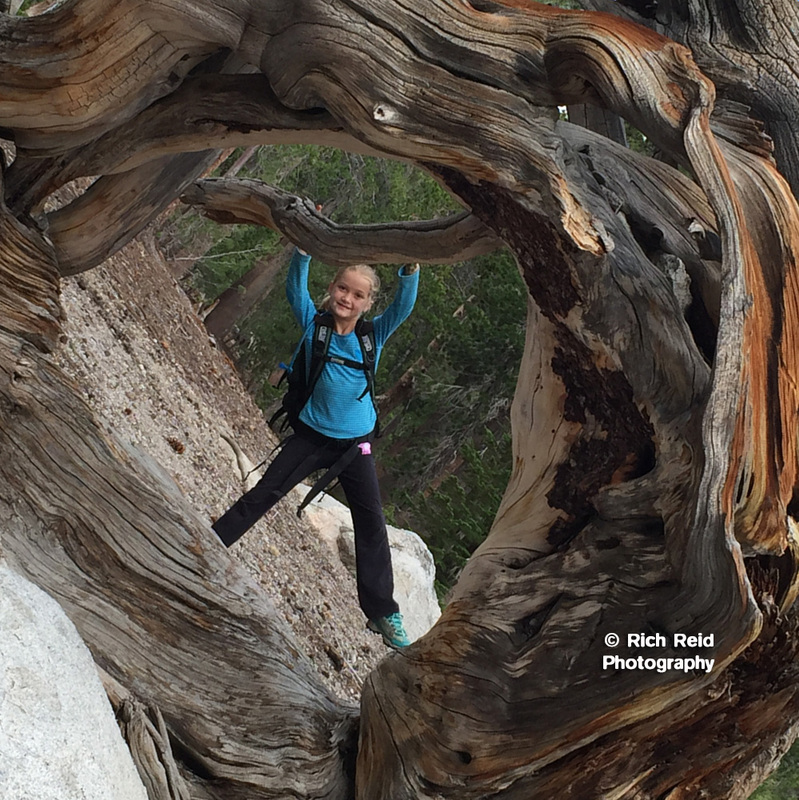 Hanging from a giant stump in Mammoth Lakes, California. DREAD KNOTS. Root system at McCloud Lake at Mammoth Lakes, California. WHY KNOTS. 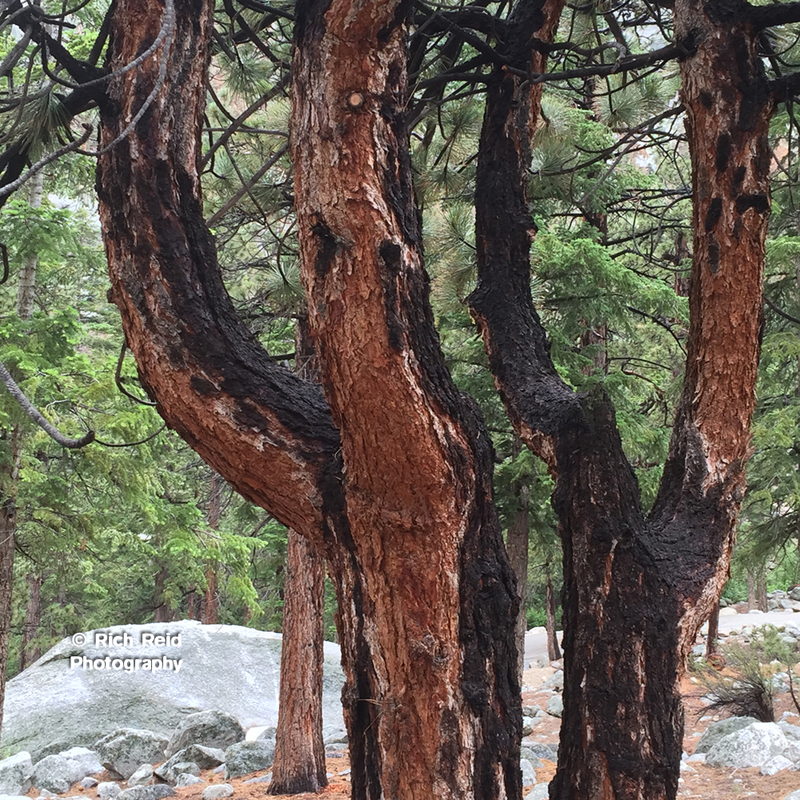 Y shaped trees at Whitney Portal Campground near Lone Pine, California. SQUARE KNOT. 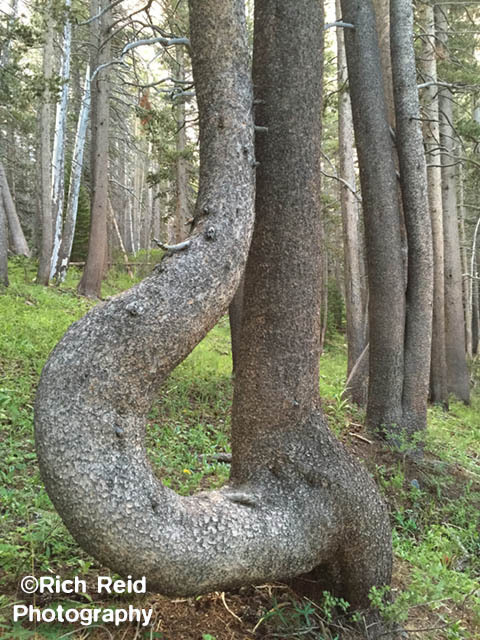 Crazy extended tree at Lake Mary in Mammoth Lakes, California. KNOT SAFE. 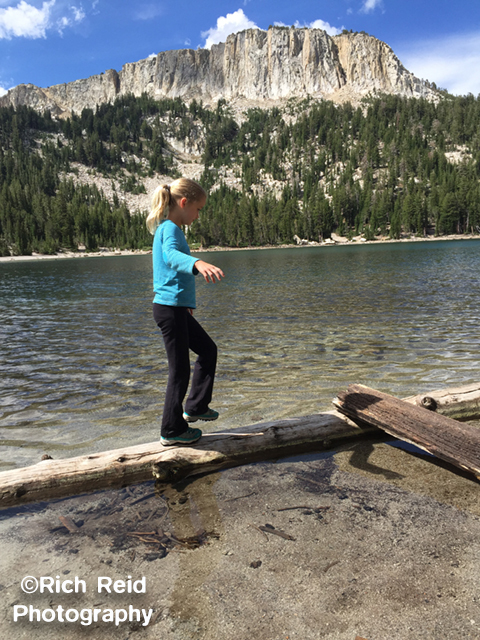 Walking the log at McCloud Lake at Mammoth Lakes, California. DO KNOT DISTURB. 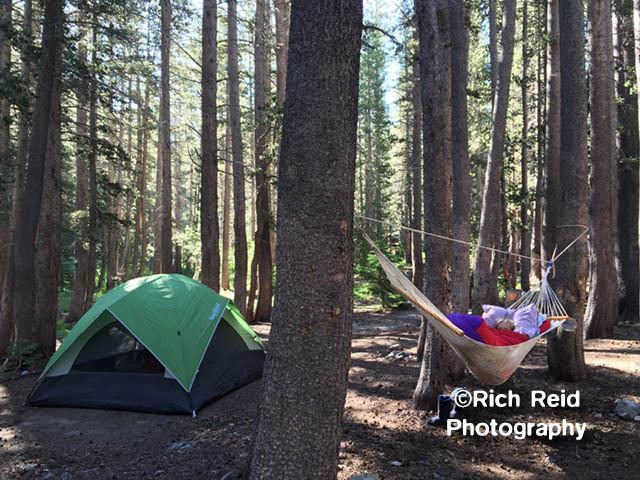 Camping at Coldwater Creek at Mammoth Lakes, California. KNOT ONE OF US. KNOT MARRIED. KNOT ONE OF US. 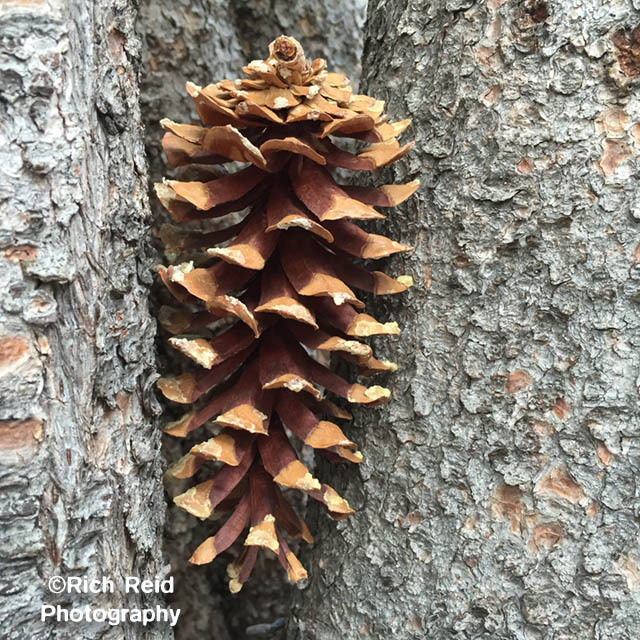 Pine cone wedge in a pine tree at Mammoth Lakes, California. KNOT MARRIED. 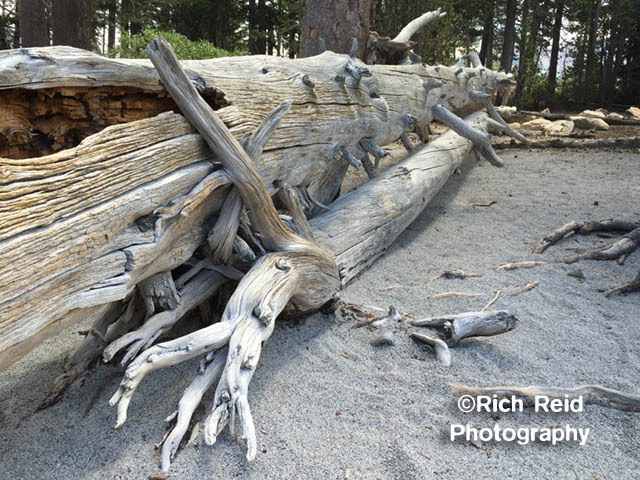 Twisted logs at McCloud Lake in Mammoth Lakes, California. KNOT FOR SALE. 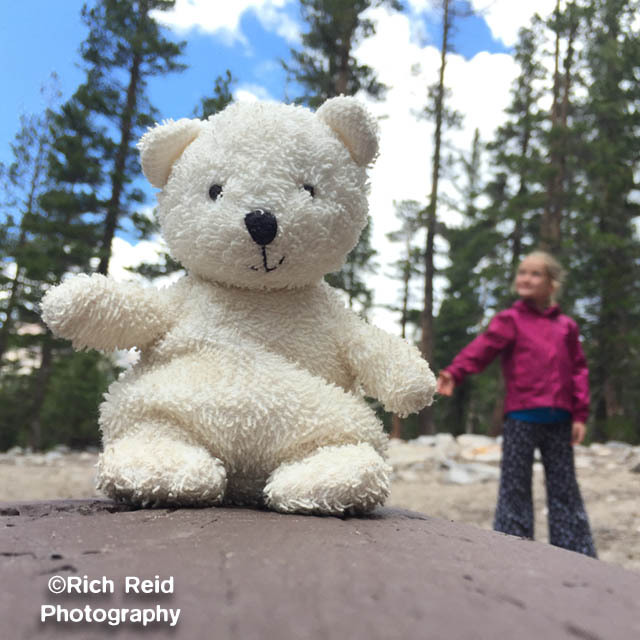 Juxtaposed stuffed big bear at Mammoth Lakes, California. and finally to the crazy July weather and rain optimism…..
HAIL YES. 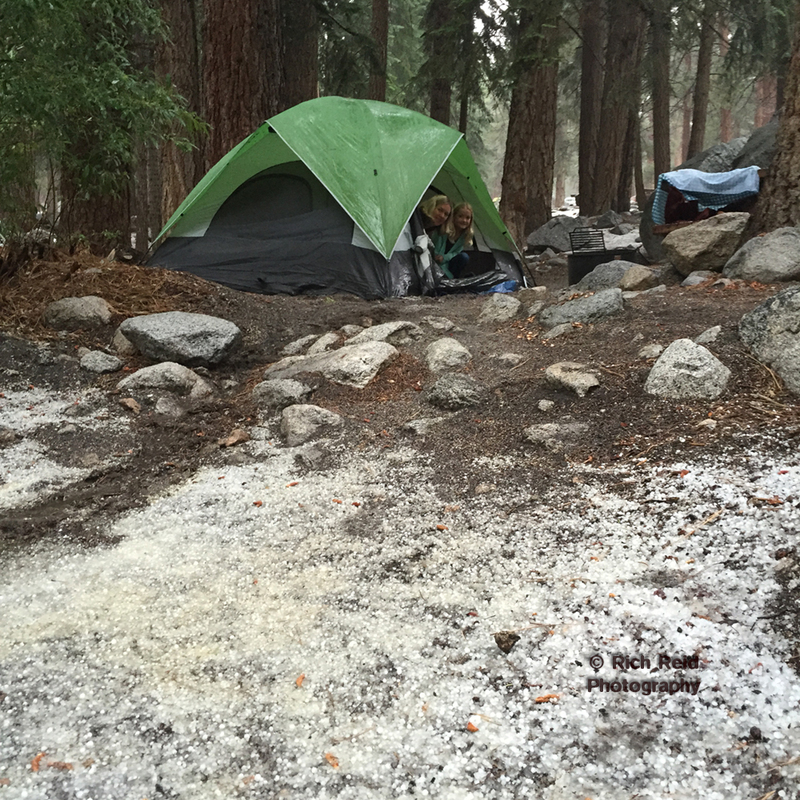 Hail at the Whitney Portal Campground in July. In October, I upgraded my iPhone from a 4s to a 6 and proceeded to snap 5,500 images in its first month. My $99 iPhone 4s has captured over 11,000 assets in its two loyal years and now has been proudly handed down to my daughter. These phones have survived punishing weather while traveling the globe entertaining guests while working on assignment for National Geographic aboard Lindblad Expedition ships. I think of the paradigm shifts in the photography industry in my last 30 years and have to admit that the smartphone has been the greatest advancement, even more than film to digital. The following top ten panorama photos were taken on my iPhones during 2014 and each image is accompanied with a photography tip and technique. The smartphone has changed the way we process our visuals as we share countless photos uploaded to social media. It has also changed the way we teach photography which is evident by the responses I have received from satisfied guests. Being able to do a live iPhone photo demonstration in front of 100 guests is evolutionary and certainly a wonderful device for connecting people across all photographic abilities. Panorama of sand dunes and the Pacific Coast Highway near Malibu, California. Panorama of person climbing a 400 foot sand dune above the Pacific Coast Highway near Malibu, California. Symmetry and Simplicity – Look for a simple composition with equal proportions on either side of the image. Panorama of the London Underground train at an empty station in London, England. Panorama of a train in the London Underground or Tube at an empty station in London, England. Distortion – Take advantage of the known barrel distortion to give your image a spherical look. Much like a cropped fisheye lens where the magnification decreases with distance from the optical center. Panorama of the shipwrecked sealing vessel, the Protector III In front of the Barnard House on New Island in the Falkland Islands. Landscapes – Selecting the correct proportion and creating visual anchors are important. Establish your height/width ratio and beginning/end of your image by doing a test pan. The camera crops approximately 10 percent from all sides so give yourself some additional room. Vertical panorama of Multnomah Falls in the Columbia River Gorge, Oregon. Vertical panorama of the Multnomah Falls, combined 620-foot waterfalls in the Columbia River Gorge, Oregon. Vertical – Turning your camera horizontally in your hand and panning vertically can benefit certain subjects like waterfalls and forests. The camera will not realign when turned so ignore the arrow which is designed only for horizontal photos. Panorama of the sunset on Mondos Beach near Ventura, California. Panorama of the sun reflecting of a beach house at low tide on Mondos Beach near Ventura, California. Reflections – Double your visual assets with reflections from windows or water. By relocating your camera left or right ever so slightly, you can capture reflections during key lighting situations. Panorama of ‘Blood Swept Lands and Seas of Red’ art installation of red ceramic roses at the Tower of London, England. Right to left panning can save your image. Your camera defaults to left to right panning motion but by selecting the right side of your image, you can pan from right to left. With this image, I started from the right and panned slowly left while waiting for people to move out of the frame. Panorama of the National Geographic Sea Bird bow in Gut Bay on South Baranof Island in Southeast Alaska. Asymmetry – Offsetting your subject to the left or right side of the frame leads the viewers eyes into visual thirds or rules of thirds. Dividing your subjects into vertical thirds also helps create a compelling composition. Panorama of the National Gallery in Trafalgar Square in London, England. Panorama of Nelson’s Column in Trafalgar Square and The National Gallery facade in London, England. Motion – If you include people, its advised to inspect all faces and appendages before posting online or end up on “panos gone wrong.” For crowds look for distant people while panning quickly and for close ups pan slowly and have your subject still. See double exposure for another fun trick. Panorama of a king penguin colony and the Allardyce Range at Saint Andrews Bay, South Georgia Island. Panorama of a king penguin colony and the Allardyce Range at Saint Andrews Bay on South Georgia Island. Wildlife – Many variable to consider when working close up with wildlife. Foremost is not disturbing the animals so be patient. When an opportunity arises, use your subject as a visual anchor and include the background for impact. Stunning panoramic sunset in the Lemaire Channel, Antarctica. Panoramic sunset in the Lemaire Channel, Antarctica. Exposure – Locking the exposure and focus is the most useful feature on the camera. Panorama often cover a wide range of exposure to the sun so find an average within your composition, many times in the center. Hold your finger on your screen over this average exposure until a yellow box plus AE/AF LOCK appears. Return to your original left or right position and pan with the exposure and focus locked on your selected spot. Works amazing! Panorama of the Waterhouse Building at the Natural History Museum in London, UK. Attending the Wildlife Photographer of the Year awards was our main objective for visiting London however, so much more was discovered and explored with my family. The award ceremony was held at the Natural History Museum, a world famous architectural gem. London is a panorama photographer paradise with subject on each corner. Panorama of the Darwin Center and courtyard at the Natural History Museum in London, UK. Public transportation is one of the most fascinating aspect of the bustling metropolis of over 8 million inhabitants and just as many tourist. Just to think you walk down a set of underground steps, jump on a train and pop up in another culturally diverse parts of this cosmopolitan city all for a pound thirty. Panorama of The Underground in London, UK. Panorama of Camden High Street at Camden Town in London, UK. The art scene is outstanding and would take a lifetime to soak it in properly. The Blood Swept Lands and Seas of Red at the Tower of London, 888,246 ceramic poppies art installation was very moving representing the British military fatalities during World War 1. The National Gallery was equally impressive with its grand halls and huge installations. Panorama of red ceramic rose art installation in the moat of The Tower of London, UK. Panorama of the Interior of the National Gallery in London, UK. People, people and more people. If you like people watching, London is it! So many different cultures and languages visiting the museums, watching street performers or riding one of the many forms of transportation. London is constantly on the move. The front seat of a double-decker bus felt like an urban zipline, while conversely I found myself ducking under each bridge from the upper ferry deck on the Thames. Panorama from a double decker bus of the Parliament on Great George Street in London, UK. Panorama from a river boat on the Thames of the Big Ben and Parliament in London, UK. Around each corner or under each bridge, another fantastic panoramic photograph opportunity arises. All just for a brief glimpses before your bus rockets off or some moving object “photobombs” your masterpiece. Sometime its a split second and proper panning techniques and exposure are critical. Panorama of Contortionist Yogi Laser performing for a crowd in Trafalgar Square in London, UK. Panorama of Vespe seats at an eatery in Camden Lock in London, UK. Connecting with good friends and exploring new places halfway around the world is always a bonding experience. And meeting so many great photographers and complete strangers made London a memorable journey. Double exposure of world traveler, Richard Villa at Hyde Park in London, UK. My many iPhone Panorama photo tips would be: patience. Wait between cars and people moving too close. Switch panning directions from right to left if the timing makes more sense. Symmetry and side subjects to anchor your composition seems to work best given the camera’s natural distortion to bend the sides and bow the center. Lock focus and exposure on the center of your frame and pan smoothly. Have fun! Panorama of Nelson’s Column and the National Gallery in Trafalgar Square in London, UK. Panorama from a boat on the Thames River of the Tower Bridge and Shard in London, UK. All images take on an iPhone 4s in London, England. National Geographic Sea Lion in Tracy Arm near South Sawyer Glacier in Southeast Alaska. Southeast Alaska is a land of superlatives; immense, iconic and impressive. These past two weeks spent on the National Geographic Sea Lion with Lindblad Expedtions was all of these and more. Two action packed weeklong “photo departures” with many of the guests fulfilling their lifelong “bucket lists” and bringing home incredible photos. The talented photo team included National Geographic Photographer, Jay Dickman and three Lindblad Photo Instructors; Rich Kirchner, Emily Mount and myself. Humpback whale breaching near the Inian Islands in Southeast Alaska. Bald eagle capturing a fish at Cross Sound in Southeast Alaska. The extra long days included early morning wakeup calls and greeted with iconic scenes like a mirrored images of Gut Bay and early morning orcas in Glacier Bay. The breaching humpback whales, feeding Stellar sea lions and eagles snatching fish around us at Cross Sound on a 16-foot incoming tide was also a life experience. Each day the “WOW factor” was greater and greater. Our visit to South Sawyer Glacier in Tracy Arm – Fords Terror Wilderness was also one of those unforgettable memories with a colossal calving from this tidewater glacier and then a twenty story cobalt blue shooter erupted from under the water. 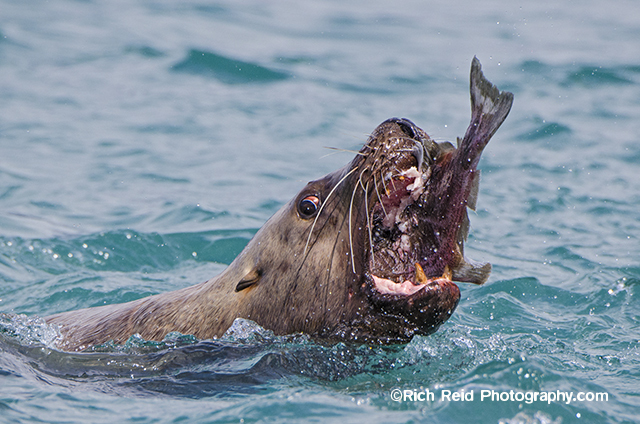 Stellar sea lion eating a fish at Cross Sound in Southeast Alaska. Inflatable boat near a recently calved iceberg from South Sawyer Glacier in Southeast Alaska. Mom and pup sea otter at Cross Sound in Southeast Alaska. I am looking forward to another six weeks of pure natural bliss in Southeast Alaska this summer. The following are my top ten iPhone panorama photos from this year and a few lessons learned after 6,000 plus attempts…. • A steady hand and smooth panning will achieve the best results. • Great light is everything when your dealing with a fixed 4mm f/2.4 lens. • Composition includes anchoring your sides and looking for symmetry. • Double Exposed works best when your subject is about 10 feet away. • Set your focus and exposure on a neutral tone somewhere in the center. Panorama of Santa Barbara from the Courthouse Observation Tower in Santa Barbara, California. Panorama of Rock Creek Lake in the Eastern Sierras, California. Panorama of fishing pangas moored in Puerto Ayora harbor on Santa Cruz Island in the Galapagos Islands, Ecuador. Panorama of the Santa Barbara Harbor from a fishing boat in Santa Barbara, California. Panorama of Punta Pitt on San Cristobal Island in the Galapagos Islands National Park and Marine Reserve, Ecuador. Panorama of the palm-lined Kalapaki Beach in Nawiliwili Harbor on Kauai, Hawaii. Panorama of the 198-foot Palouse Falls and river in Palouse Falls State Park, Washington. Panorama of Gardner Bay beach on San Cristobal Island, Galapagos National Park, Ecuador. Panorama of the National Geographic Sea Lion bow and Fairweather Range in Glacier Bay National Park and Preserve, Alaska. Panorama of sunset over the Asilomar Coastal Trail in Pacific Grove, California.